Money matters? 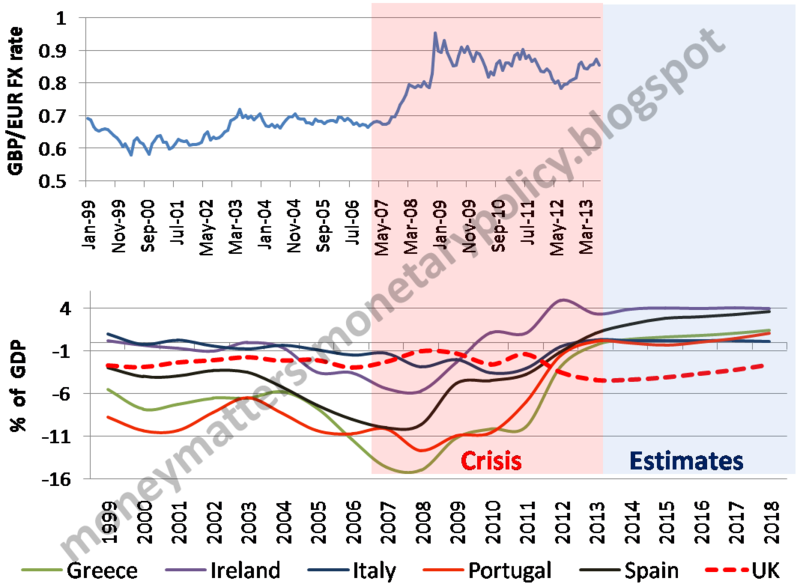 Perspectives on Monetary Policy: A China-USA monetary Union? Much has been made, while discussing the euro-area crisis, of the fact that countries using the euro have lost the ability to correct their imbalances through changes in nominal exchange rates. So, taking the most extreme example, Greece could not devalue its exchange rate towards Germany to deal with its imbalances. The statement is of course correct, but needs three qualifications. First, recent experience has confirmed that there are also other instruments to correct current account imbalances: indeed, even without the ability to devalue, all peripheral countries either have or are about to reach balance or surplus in their current account (Chart 1). 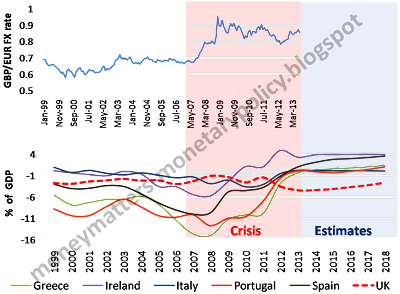 This correction has not only been large (the current account deficits before the crisis were, for example, 11% of GDP or more in Greece and in Portugal, 9 % in Spain) but has also taken place notwithstanding the generous funding by the European Central Bank of the balance of payments deficits of peripheral countries through the Target 2 balances. This funding has reduced the urgency to exit from the deficits and tilted the balance between funding and adjustment towards the former. The adjustment in the periphery of the euro area is even more impressive if compared with the UK non-adjustment: notwithstanding the sharp depreciation of the pound between 2007 and 2009, the UK current account deficit has remained in deficit and has been even increasing of late. Second, it is of course true that exchange rate fixity, being irrevocable, is of a special nature in the euro-area, but it is not the case that outside of the euro area there is perfect exchange rate flexibility. This is shown in the following table, which ranks a number of bilateral exchange rates in order of increasing variability: so the German-Greek exchange rate, taken as short-hand indication for the irrevocably fixed exchange rates in the euro area, is top of the list, with a value of 0 variability, while the Indian rupee/US dollar exchange rate is the most flexible one among those considered in the table. 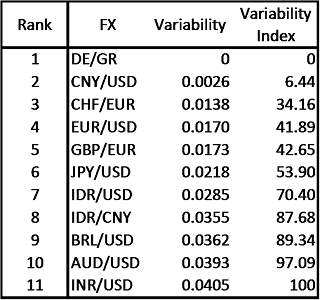 To facilitate the reading of the table the estimates of variability of the different exchange rates are also presented as percentages of the estimate for the Rupee/dollar. Variability is measured as the standard deviation of the natural-log differences of an index of exchange rates over a six month time span. Estimates carried out over a longer time period (5 years) and using as statistic the square root of the squared first differences of the log of an index of exchange rates give very similar results. Of course, a given exchange rate may be stable because the two countries that are linked by it are subject to the same shocks and have the same structure. It is hard, though, to believe that, just to make an example, the US and the Chinese economy are subject to similar shocks and have analogous structures, so that there is little need for the renminbi/dollar exchange rate to move. Indeed the renminbi/dollar exchange rate is the closest by far, among those considered in the table, to the hypothetical perfectly fixed German/Greek exchange rate and has a variability which is one fifth of that of the exchange rate between the Swiss franc and the euro, notwithstanding the closeness of the two underlying economies. Germany and Greece are tied by a monetary union, but something not too far from a monetary union also binds China and the USA! Third, the advanced economies exchange rates are overall less variable than those of emerging economies, as they are mostly in the upper half of the table. The position of the Renminbi in second position, which of course is the result of the foreign exchange policy of Chinese authorities, is thus even more remarkable. 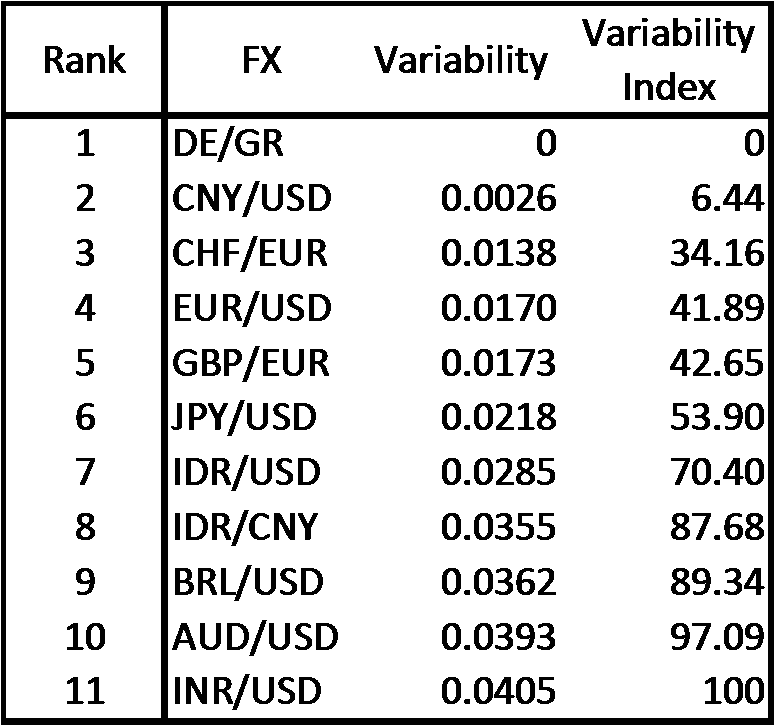 Symmetrically, one can note the flexibility of the Australian dollar/US dollar, which is the only advanced economy exchange rate which is in the lower half of the table, where mostly emerging economies exchange rates are. The remark that emerging economies have, generally, more variable exchange rates than advanced economies is also important when assessing current developments, in which emerging economies are under stress and have to adapt to the pre announced tapering by the FED: exchange rate depreciation can act for them as an adjustment tool more than for advanced economies. Exchange rate variability is more important for emerging than for advanced economies. This Post was prepared with the assistance of Mădălina Norocea.